Ever since it became apparent that Secret Wars (the 2015 edition) was going to radically affect the Marvel Universe, there has been speculation about how Marvel Comics was going to look once it was concluded. Was it a line-wide reboot? Recently, we found out that it is definitely not a reboot. I also looked at some characters would might be changing due to Secret Wars. Last week, Marvel came out with announcements of their post-Secret Wars comics. There were a number of surprises, so let’s discuss what’s in store for the future of All-New All-Different Marvel Comics. The biggest curveball in my opinion is that Venom is now going to be a cosmic character in Venom: Spaceknight from writer Robbie Thompson and artist Ariel Olivetti. The term “Spaceknight” originated with the 1980s series Rom: Spaceknight, based on a toy line for which Marvel has since lost the license. Of all the characters one could expect to become a new Spaceknight, Venom wouldn’t rank near the top. But since Flash Thompson has become a heroic version of Venom (sometimes called “Agent Venom”), he’s been a part of different sorts of missions. So it’s not entirely unprecedented, and it’s a cool idea, though still it’s unexpected in a good way. To reinforce Venom's new cosmic-ness, he's also a member of the Guardians of the Galaxy now. 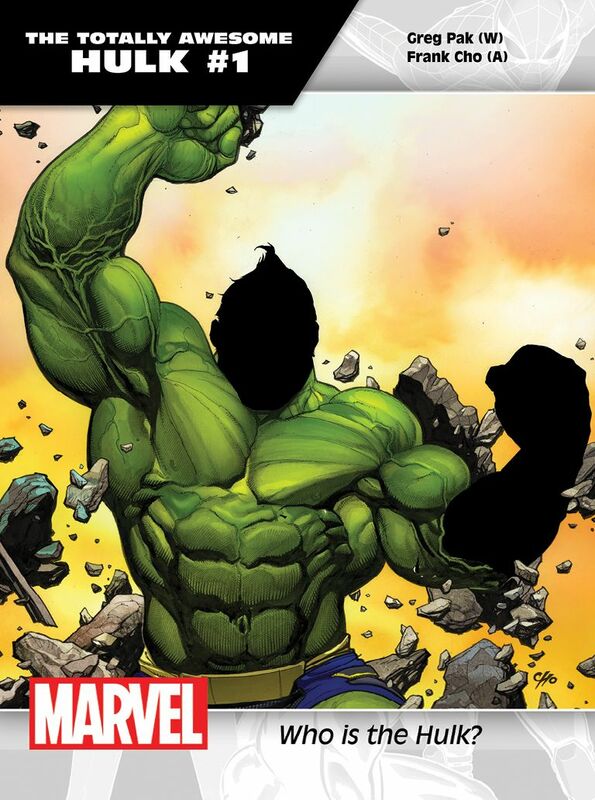 Marvel has been unequivocal about there being a brand new Hulk. In other words, it’s definitely not Bruce Banner. The running theory is that when The Totally Awesome Hulk (yes, that is the real title… I guess The Gnarly, Radical Hulk Dude was nixed) debuts, it’s going to be Amadeus Cho who will be the green one. Cho has long been a supporting player in the Hulk series, and he was created by TTAH writer Greg Pak. We’ve had Hulk and many She-Hulks before, but this is the main Hulk and Marvel promises a new type of Hulk, one less conflicted and tormented. Cho as Hulk could be a lot of fun. If it’s not Cho, it would be an even bigger surprise. Some fans had a theory that due to the film split of X-Men and Fantastic Four to 20th Century Fox, both the FF and X-Men were going to go away from Marvel Comics. However, the two franchises are quite different. Fantastic Four has not been selling well and it’s relatively contained. X-Men, on the other hand, is a massive sub-universe in Marvel Comics and some of its titles still sell pretty well. So while FF might be gone for a bit (though its characters aren’t), X-Men are definitely part of “All-New, All-Different Marvel.” All-New X-Men continues with the time traveling original X-Men; Uncanny X-Men has a sort of X-Force line-up; and Extraordinary X-Men is a combo of 616, Ultimate, and other X-Men. Biggest surprise so far is no sight of present-day Scott Summers or Emma Frost. So there may also be a Cyclops-led X-book on the way. While it’s not a shocker that Marvel is sticking with Sam Wilson as the new Captain America, I do find it unexpected that they’re keeping Steve Rogers as an old man. Personally, I’d like to see him younger with a different identify (along the lines of Nomad, although there is now a different Nomad). He’s not the only geriatric hero, either. As expected, Secret Wars is being used to bring back Wolverine, though as Old Man Logan (X-23 will be the new Wolverine) from a different reality. Also, All-New Hawkeye brings Kate Bishop as Hawkeye versus an old-man Hawkeye from another reality. That’s a lot of grey hairs in the Marvel Universe. Somewhere, Silvermane and Adrian Toomes must be thinking, “It’s my time to shine!” Despite these points, most of the “All-New All-Different” Marvel titles were not that big of a surprise. They are keeping popular titles from pre-Secret Wars and shuffling new characters from various universes in less successful and new titles. Some may feel that Marvel is not being bold enough and there was more room for diversity, especially in solo books (there does seem to be a larger number of female-led books than before). However, only a portion of all the “All-New, All-Different” Marvel titles have been announced. So there is a still a chance Marvel is saying the real flabbergasting announcements for later. All in all, it seems like Marvel is throwing a few unexpected titles out there while banking on popular teams and characters.